Promo Price ends in 2 days! Your favorite marsupial Crash Bandicoot is back! He’s enhanced, entranced and ready-to-dance in the Crash Bandicoot N. Sane Trilogy. The Crash Bandicoot N. Sane Trilogy lets players spin, jump, wump and repeat as they take on the epic challenges and adventures from the three Crash games that started it all: Crash Bandicoot, Crash Bandicoot 2: Cortex Strikes Back and Crash Bandicoot: Warped. Now fans can experience the beloved ‘90s video game icon like never before in this remastered game collection. In this new trilogy, Crash fanatics can relive all their favorite moments in fully-remastered HD graphical glory and put some UMPH in their WUMP! The Bandicoot is Back – The marsupial that defined a generation is better than ever in a first-ever remaster of the original trilogy: Crash Bandicoot, Crash Bandicoot 2: Cortex Strikes Back and Crash Bandicoot: Warped. Now in Face-Melting PS4 Pro HD – Crash Bandicoot® N. Sane Trilogy is being built from the ground up for the PS4 with brand-new lighting, animations, environments and recreated cinematics—all in stunning “N. Hanced Fur-K” and PS4 Pro HD. New animations, visual effects and environmental details let players spin, jump and jet pack their way through the lush—and furriest—Wumpa Island yet! Original Story, New Tech – Full analog stick support, a unified save system and unified checkpoint system make it easier than ever to enjoy the classic adventure. Plus, improved bonus levels and time trials everywhere will make this an epic trilogy for the hardest of the ‘Coot core! Say What? – Fans of the Crash Bandicoot games may recognize some familiar voice actors who appear in Crash Bandicoot® N. Sane Trilogy, such as Jess Harnell and Lex Lang. N. Sanity Beach – The first level of Crash Bandicoot, this jungle-themed island eases players into the gameplay mechanics and features the iconic view of Crash’s backside. Heavy Machinery – Also included in Crash Bandicoot, this level is set in an industrial factory and features classic side-scrolling action and two bonus rounds. Crash Bandicoot 2: Cortex Strikes Back – The evil Dr. Neo Cortex is back…out this time to save the world? And he’s asking for help from his arch nemesis, Crash Bandicoot? Is this just a conniving plan to lure Crash into Cortex’s next dastardly experiment? 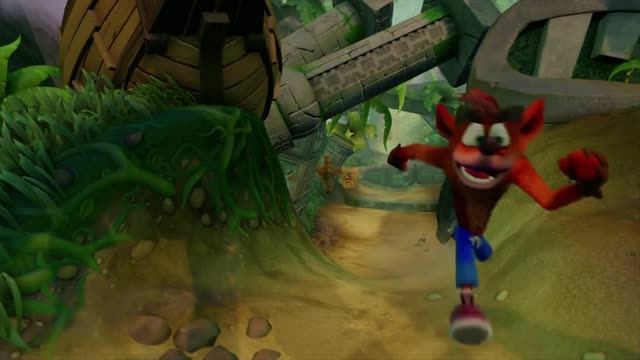 Can Crash win again or will he join Cortex’s mindless zoo? Bigger free-roaming 3-D environments, all-new animations and a whole host of colorful characters – watch as our hero Crash, ice-skates, rodeo-rides a polar bear and jet-packs through zero-gravity in the continuing adventures of Crash Bandicoot 2: Cortex Strikes Back – This time he ain’t joking! Crash Bandicoot Warped – Oh yeah…he’s back…AND he’s ready! It’s a Whole New Time-Traveling Adventure! All new-style gameplay action – scuba dive, ride a motorcycle or a baby T-Rex and go free-roaming airborne in a plane! Play as Coco! Gallop along the Great Wall of China on a tiger, go extreme on a jet-ski and other high-flying surprises! Prove your skills with the new Super-charge Body Slam, Super Slide, Double Jump, Death-Tornado Spin and a Laser-Guided Bazooka. All new enemies include a new Big Boss, Uka Uka, N. Tropy, a menacing Dingodile and of course, the return of some favorites like N. Gin and Tiny. More Action. More Fun. More Puzzles and Secret Levels. And you didn’t think it could get any better! The game gets quite tough especially if your muscle memory is still wired for the old games. It is however tons of fun, definitely worth the purchase even at full price. Initially being a skeptic of remastered work, I decided to go ahead and buy this remake anyways. The platforming of all 3 games retain the demanding and punishing challenge of the originals, while the visuals have been polished to match with today's high standards of gaming. The audio has also been given a boost as well, giving the game a fresh yet nostalgic feel. The first game is quite pale in comparison to the other two but still fun nonetheless. The developers have done an outstanding job with the remaster and I give this trilogy a 5/5!!!! A Must buy for those like me, looking to revisit the stuff they grew up with, or even for the youngsters looking for something fun and innocent to play. What a great game for a great price! I remember playing these games growing up and boy have they done a great job. The nostalgia I felt while playing them was unbelievable. From the same music to even better graphics, better then I could have ever imagined. This is also a great price for a 3in1 package. Suitable for all ages. You really cannot go wrong. Crash is Back! and so Worth it! Crash Bandicoot is the original mascot for the Sony Playstation back in the early 90's and it was only a matter of time before he returned and with a brilliant remaster of the original trilogy. Not only is this trilogy set a Nostalgic trip of note, it also brings back the same challenging levels, meaning it isn't watered down. All levels beautifully remastered, bringing our imagination of what it could've looked like, back in the 90s, to colourful life. It is perfect to introduce the newer generation of gamers to old school 3d platformers and showing what real challenging and speed levels are all about, whilst maintaining the nostalgic element for older fans of the original series (I throw original around a lot, because what came after Crash 5, wasn't the best) I can only hope they bring back Crash Team Racing, Crash Bash and Crash 5 Wrath of Cortex, just to complete the Series. If anything this trilogy makes you want more. A solid 5 outta 5! Not difficult to figure out. 3 games in 1! how often do you get that?! Great nostalgic fun, really tough challenge! The Crash Bandicoot games were my absolute favourite growing up, so I was thrilled at the news of the original trilogy being rebooted for the PS4! The graphics are the biggest improvement, with Crash looking much less geometric. The soundtrack is my favourite part, and hasn't changed a bit, with the same catchy music that you'll be humming all week! All of the levels are just as much fun as you remember, with all the original characters joining in. The biggest issue is with the controlls and gameplay, and it's where the game trips up significantly. Yes, the original games were challenging, but they weren't impossible. The fun quickly wares out after no less than fifty attempts trying to beat a level! For what is supposed to be pure nostalgic fun, it's a pitty they dialled up the difficulty so much on what is otherwise a perfect remaster. Played the trilogy on my PS way back and was stoked to see a old friend return in remastered state. If you enjoyed it way back you should enjoy again now but be warned can be a little difficult a specially Crash Bandicoot1. This game stays true to the original games and Graphics look brilliant. It's the same great game but with HD graphics etc, it's allot of fun, not the easiest game if you are a trophy hunter, but can play hours on end. The game looks great and is decent value however the controls are terrible. I revisited the original PS1 games on my PS3 and its a night and day difference, especially when it comes to the special levels involving the riding or controlling of a vehicle or animal. I would rate it lower just for this but it still captures the heart of the franchise. The only other issue is the rounded ledges and edges on which you used to be able to stand but now roll off since the new engine has a setting incorrectly set up that makes the very edge of an item rounded so you fall off instead of staying put - This is contrary to the original game and makes many levels far more challenging than intended. I played the original title way back when and when this came out I had to have it. It's a great game which provides many hours of fun and nostalgia. Would recommend this to anyone whether they have played the original or not. through and through a perfect remake of the original trilogy! You do get frustrated a lot if you're hunting all the PS trophies, but otherwise no cons, just pros! A classic 90s game, enjoyable for all ages. The game looks great and is fun to play. Crash 1 is pretty difficult, but the other games are more relaxed.